Alaska residents know that in order to live and thrive in this state, one has to wear many hats. 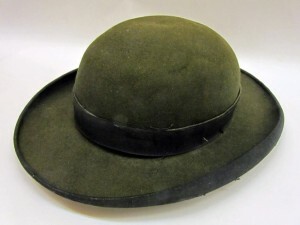 The long-time Alaska resident who once owned this hat did just that…he exemplified the notion of a modern Renaissance man. Born in 1874 in Wisconsin, Theodore C. Kettleson first ventured to Alaska in 1905 during the gold rush. He prospected in Valdez and Goldstream and in Rossland, British Columbia. Kettleson went on to serve as Postmaster at Chisana and Shushana, and worked as a steamer pilot on the Tenana River. In 1919, Kettleson was elected to the House of Representatives of the Territorial Legislature. After his term ended in 1921, he accepted a position as the Superintendent of the Pioneers’ Home in Sitka. Twelve years later, Kettleson went to work at the Sitka Wharf & Power Company as a plant operator. By 1939, Kettleson, along with a group of notable Sitkan gentleman, founded the First Bank of Sitka. Around the same time, he began a fifteen year stint as the Chairman of the American Red Cross in Sitka. He also owned stock in the Sitka Cold Storage Company. Eventually, Kettleson retired and moved to San Diego with his wife, but continued to take an active interest in Sitka and the community. After the town’s library suffered the second of two devastating fires, Kettleson decided that the institution needed a new concrete-built home and he contributed his stock in the National Bank of Alaska and the Sitka Cold Storage Co. to the effort. In October of 1967, Kettleson and his wife traveled back to Sitka for the dedication of the new library, named in his honor. 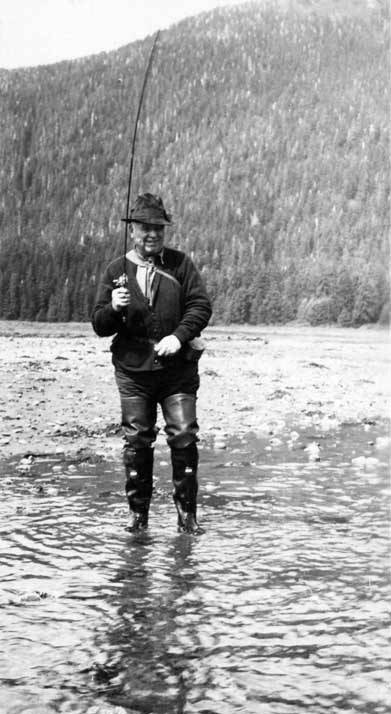 “Ted Kettleson in Action.” Courtesy of the Alaska State Library, Portrait File Collection, ASL-Kettleson-Theodor-C-1. During his time in Sitka, Kettleson made another rather furry contribution. As the Secretary of the Sitka Fish & Game Club, Kettleson advocated for the introduction of red squirrels to Baranof Island in 1922. He hoped that the squirrels would provide prey for marten and thus would increase trapping opportunities around Sitka. Unfortunately, the plan did not succeed and the squirrels came to inhabit the entire island and disturb bird populations by eating their eggs. Less than a year after the dedication of the Kettleson Memorial Library, Ted passed away at the age of 94. From mining prospector to House Representative and beyond, Ted Kettleson wore numerous hats as an Alaska resident. His many skills and interests left a lasting legacy in Alaska, yet the noisy chatter of the vivacious red squirrel serves as a constant reminder that even the most notable and noble figures in Sitka’s history were merely human.